If you find yourself overwhelmed by a garden that seems to grow wilder by the second, you’ve probably realized by now that the average shearers or clippers just won’t cut it anymore. For a garden that needs a bit of extra power to handle it, you need to equip yourself with a power tool that can get the job done. Traditionally, chainsaws were reserved for just the large jobs such as cutting down trees, but this new range of compact chainsaws are far better at tackling the small jobs. If you want something a little more than your hand tools can offer but aren’t ready for a full powered chainsaw, there is a good middle ground. The GreenWorks 9 Amp 14” Electric Chainsaw is part of the GreenWorks Lawn range and is intended to make light work of your garden troubles. This chainsaw is perfect for those jobs that are a little too big to do by hand, and without the hassle of gas operation, you’re given a cleaner and quieter machine to work with. GreenWorks is a leader in innovative power tools for your home and garden, with a wide range of chainsaws and other products designed to take the hard work out of maintenance. Their corded lawn tools range gives you a reliable option without needing to rely on gas-operated devices which can be noisy, messy, and harder to operate. Their 9 Amp 14” Electric Chainsaw is lightweight and easy to use, with enough features to suit even the most amateur power tool operator. This chainsaw is ideal for work around the yard, and won’t give too much power when you don’t need it. This chainsaw would suit anyone with a garden to maintain, as it’s the perfect size for trimming branches and cutting down smaller size trees and wood. It has all of the features you could ask for in garden power tool. For those looking for a good entry level chainsaw that will handle the smaller jobs around the home, this a great way to get your work done without breaking the bank. When you make the conscious decision to ditch your gas powered tools, you’ll realize just how clean and effective these electric varieties can be. The best thing about the Greenworks 9 Amp 14” Electric Chainsaw is just how easy it was to operate. From reviewers who had never operated a power tool before to those who were proficient at operating machinery in their garden, everyone seemed impressed with how simple it was to use. There’s no need to get it revved up before use either, with a simple button you can be getting down to business with your electric chainsaw. Some reviewers have commented on the length of the power cord, but with a simple extension cord, you’ll be able to reach more places in the yard. If you’re wanting more portability than this can manage, you may need to revert back to a gas powered model. However, electric tools have the benefit of quieter and cleaner operation that you can get with this chainsaw. Don’t expect a professional grade chainsaw, though, as it’s fairly low cost. If you’re looking for something to do the heavy duty stuff around a farm or backyard you might want to invest a little more. However, for general yard work and things that can’t be tackled by hand, the GreenWorks Electric Chainsaw is right for the job. 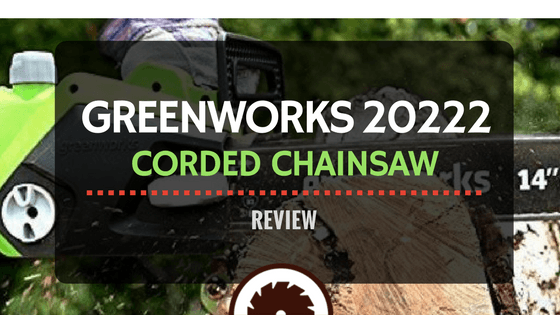 If you want an entry level chainsaw that’s ideal for gardening, the best place to purchase your Greenworks Electric Chainsaw is through Amazon. Currently, you can get the chainsaw for just over $50 which includes free shipping as well. If you’re a Prime member you can even qualify for express shipping and receive your chainsaw in time to get the weekend chores done. This electric chainsaw comes with a four-year limited warranty from the manufacturer, but if you’re after extra coverage you can purchase Amazon’s three-year protection plan for less than $15. This will cover you for an additional three years once the warranty expires and includes mechanical and electrical failures. If they’re unable to fix the item, they’ll give you an Amazon gift card for the full replacement value so you’re able to purchase a new one. To keep your chainsaw lubricated you might also like to purchase some oil for the bar and chain, and Amazon recommends Oregon 54-026 as a popular choice. To really make a difference in your garden you could purchase a blower or hedge trimmer so you can have the best yard on the street, however, for the really tough jobs, it has to be the Greenworks Electric Chainsaw. Greenworks have proven their popularity with a whole range of corded and non-corded power tools for around the garden. Their 14” 9 Amp Corded Electric Chainsaw is a lightweight but effective way to keep things tidy around your house without needed to resort to anything too heavy duty. To make the switch to electric power tools and say goodbye to the noise, pollution, and mess of a gas powered device, click here to purchase your Greenworks 14” 9 Amp Corded Electric Chainsaw today.